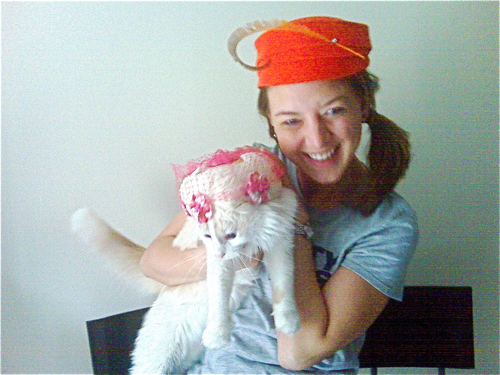 From Rachel: When Pam asked me if I wanted to guest post on her blog, I could not have been more honored. I’ve been following this blog since it began, and I know how inspirational her cooking and life tips can be. 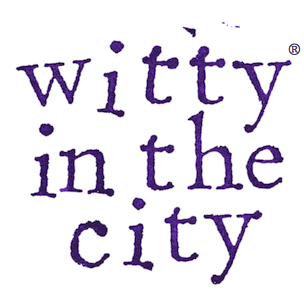 Therefore, I thought to myself, “What am I going to contribute to Witty in the City?” That answer was obvious, my recipe for cheesssey twice-baked potatoes. For those of you who do not know me, potatoes are a key staple of my diet. One time, my boyfriend and I calculated it out: I have eaten roughly 4,160 pounds of them in my lifetime. Twice-baked are by far my favorite for the following reasons: 1. Any food that acts as a vehicle to put cheese in my body is amazing; 2. 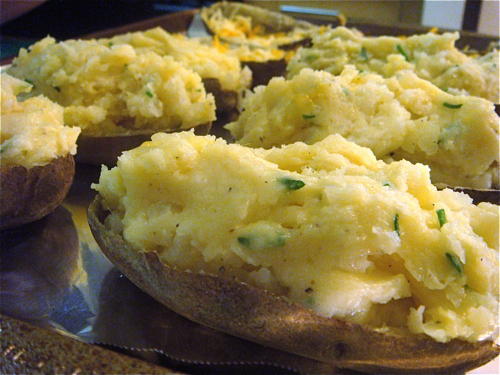 On Sunday, I can make 10 twice-baked potatoes and eat them all week; 3. 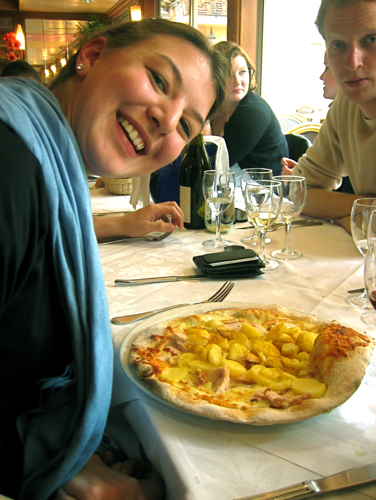 Potatoes are super cheap, last a long time, and provide the perfect cure for a hangover, therefore, they are an all-star food for college students (or law students) like myself. 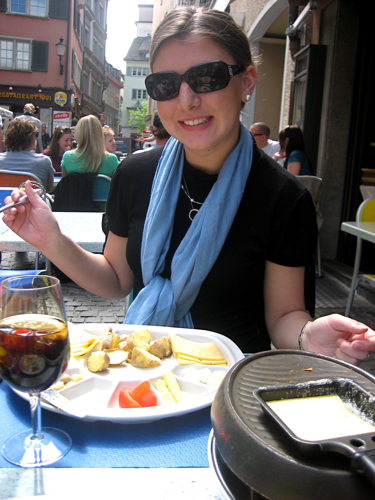 The first time I shared a twice-baked potato with Pam was at our small apartment in Paris during the spring of 2008. We had one very small oven that was positioned on a shelf, too high for American safety standards. Pam and I were forced to hoist ourselves up onto a shaky chair just to look in. Getting food out of the hot oven was even more dangerous and usually required a team effort. One night, probably after a long wine-drinking binge on Ponts des Arts or Rue Mouffetard, I arrived home hungry (somehow I did not manage to eat an emmental crêpe on the way). I placed my favorite dish, a leftover twice-baked potato in the oven. You probably know where this story is going- I burned my arm trying to extract that cheesey morsel. The next day, Pam and I went to the local pharmacy to get some sort of burn cream. We dutifully looked up the phrases we needed to know to convey the symptoms and purchase the medicine. Yet, something went amiss. When I told the lady that I had burned myself, she looked at me and muttered, “La?” (“there?”), and then pointed to her hip. No, we shook our heads. “La?” she pointed to her other hip. No, we shook our heads, and I pointed to my arm. Equally confused, she gave me some sort of cream which proved completely useless. As of this day, there is a faint mark on my arm where the oven won and the cream-based medicine failed to cure. Pam and I still enjoy speculating what that cream actually was and why in the world I would burn my hips. 1. Use 5 russett potatoes (almost any kind will do, but those with thick skin work better) Wash well and poke small holes in the potato with a fork (stab it about 4 times). 2. Bake them in the oven at 400º for 1 hour (I know it’s a long time, but be patient and it will definitely pay off). 3. 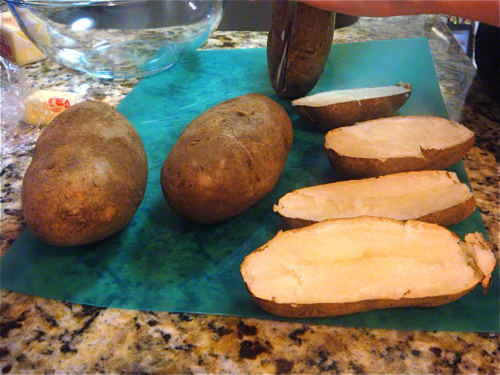 Cut each potato in half, take a spoon, and scoop out the center. 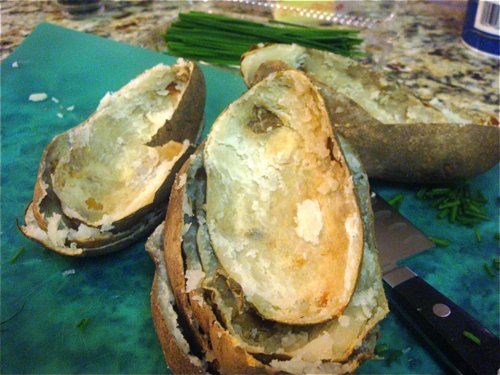 If you have baked it long enough, the potato inside should be fluffy and eager to leave the skin. 4. 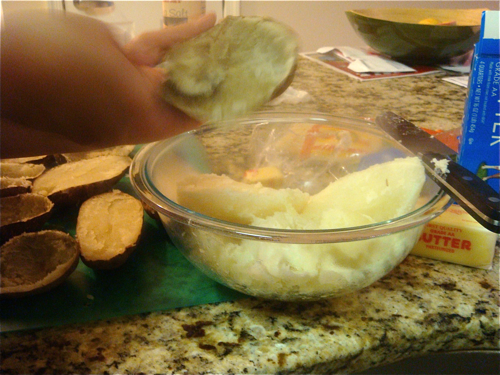 Place all of the inside potato into a large bowl and keep the empty skins to the side. 5. Add to the potatoes 1/2 stick of butter (the more the better, but health concerns do become an issue) and about 1 cup of shredded cheese. As a teacher of twice-baked potatoes, I am afraid I cannot be more specific. I learned to cook from a long line of “dumpers,” my mom and grandma NEVER use recipes. Ingredients make their way into food at will. It always comes out tasting perfect, albeit slightly different than the last time it was crafted. Unfortunately, I have also become a dumper. Usually, I put in all of the cheese I have in my refrigerator. Whatever the kind. I use white cheese when I want friends to think there is little cheese in the potato. I use orange cheese when I want to convince my boyfriend it’s more cheese than potato. I use asiago cheese when I want the potatoes to appear classy (note from Pam: HAHAHAHHAHA), and I use a blend of cheese when I don’t have enough time to go to the store but have a few random bits at home. Any cheese will work, so my advice is to use your favorite. 6. After you add the butter and cheese add salt and pepper to taste and then pick an herb. Pam and I used chives, basil is my personal favorite, dill works well, but anything fresh is preferred. 7. 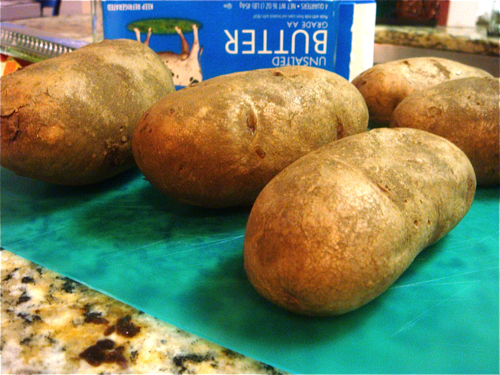 Once all the potato filling is in the bowl, take a butter knife and run it through the mixture. Usually I keep the knife running through and spin the bowl to get it whipped together. Then take a spoon and give it one last mix. 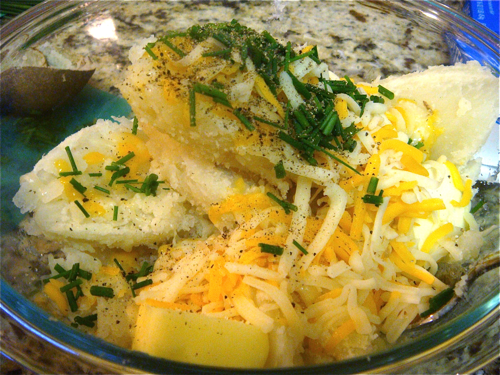 Usually, the potatoes are fluffy enough when the mixture is one big ball in the center of the bowl. 8. 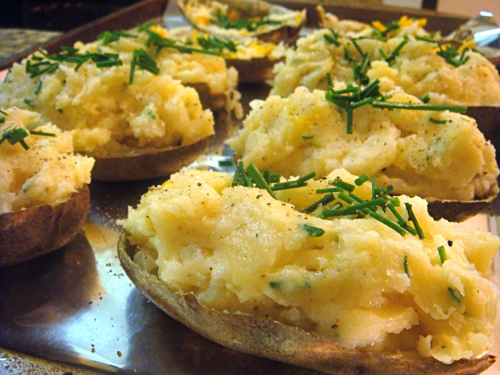 Use a spoon and fill the empty skins with the potato mixture. I over-stuff them a bit. Out of 5 whole potatoes, I only have 6 full halves. 9. I filled the remaining halves with cheese and chives. 10. Put the potatoes back in the oven on broil for about 7 minutes or until they are golden brown on top. 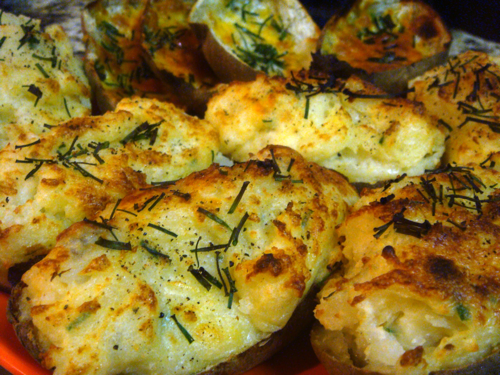 Hint: be sure to make leftovers because cheesey potatoes are like pizza, they always taste better the next day. I am going to make this tonight. Looks delicious, but decadent!